Does the combination of classical music and delving into the lives of birds sound like a hoot? If so then City of London Sinfonia’s (CLS) series, Absolute Bird, is perfect for you. For three nights in May across some of London’s most-loved concert venues, CLS will create a sweeping birdcall soundscape with three unique programmes of music ranging from medieval to modern, featuring an array of phenomenal artists. Who hasn’t ever looked out of the window on a rainy British day wishing they could be transported to the other side of the world, to the sunshine and wonder of Australia? Well, with Absolute Bird: Sounds of the Outback, a night of musical exploration celebrating one of the most diverse and fascinating natural environments in the world, you’ll almost feel like you were really there. During the evening, you’ll be encouraged to become part of the performance by using birdsong recordings sent before the concert to play on your phone, helping to recreate the feeling of being deep within the Australian soundscape. City of London Sinfonia brings to life the splendour of Australian birdlife through music utilising and inspired by Australian birdsong, including Ornithologist and musician Hollis Taylor’s Absolute Bird with recorder virtuoso Genevieve Lacey, who also performs Whistles and Whispers from Uluru, a musical representation of Australia’s iconic natural landmark. Also featured is Moondog’s Birds of Paradise. 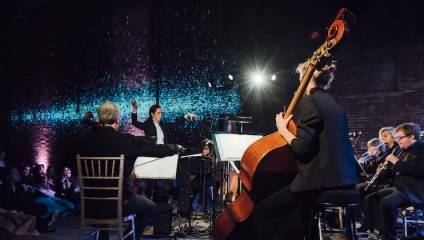 The result is a stunning evening of music inspired by the natural world. Ever wondered what kind of bird you’d be if given the chance? Well, on 15 May you can flock to Southwark Cathedral for an interactive evening of medieval to classical birdsong music where you’ll get to be part of your very own flock. Hosted by TV and Radio presenter and President of the RSPB, Miranda Krestovnikoff, you, the audience, will be guided through an interactive journey into the songs of cuckoos, nightingales and, Miranda’s favourite, hens, through works from composers such as Vivaldi, Haydn, Janequin and Couperin, that have been inspired by their calls. Much like humans, birds love a chat, whether that be to warn about danger, defend their nests or woo a potential mate. Whilst you might not be asked to do any of those during the evening, one highlight of the night is a game using pre-supplied birdcall recordings for your phone where you’ll find out which of the three species you are and congregate with your fellow birds. Will you choose to be a seated ‘birdwatcher’ or be ‘Free as a bird’ by wandering around the Cathedral and experiencing the music in different acoustics? Treat yourself to a mini-festival of musical birdsong with three events in one evening that makes up Absolute Bird: Translating Nature at Southbank Centre's Queen Elizabeth Hall. Focusing on music by composers from the 20th and 21st centuries who famously translate birdsong and nature in their music, Translating Nature begins with a pre-concert talk with nature and classical music specialists including Miranda Krestovnikoff (RSPB President), followed by a concert with full orchestra and vocals, and finishing with a late-night improvised set with members of the Orchestra and award-winning folksinger Sam Lee. The late-night set gets an extra element of magic thanks to a live rendition from some feathered friends in the shape of a broadcast of Nightingales singing in an ancient English woodland, who will be the inspiration behind the performance. Absolute Bird: Translating Nature is at Queen Elizabeth Hall, Southbank Centre on 24 May.